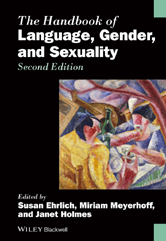 Written by leading specialists in the field The Handbook of Language, Gender and Sexuality is a collection of articles examining the dynamic ways in which women and men develop and manage gendered identities through their talk. The handbook has been extensively updated with a new introduction and chapters focusing on key themes and issues across historical periods, and methodologies and cutting-edge research topics in the field today. In-depth overviews explore the study of language and gender worldwide, and the collection features data and case studies from interactions across a range of social contexts and communities. This comprehensive resource provides a state-of-the-art overview of language and gender for established scholars and an essential introduction to the field for advanced undergraduate and graduate students in a wide range of disciplines.